I've figured out the third mystery switch in the CT 1402 reader. It's part of the "Group mark 12-5-8 12-7-8 (M94618)" RPQ, along with the other two switches. I found the ALD page for this RPQ: 90.10.12.2 (attached), and it shows the third switch controls the validity check. Carl - The ALD is in the CT binder in section 90; that's where I found it. 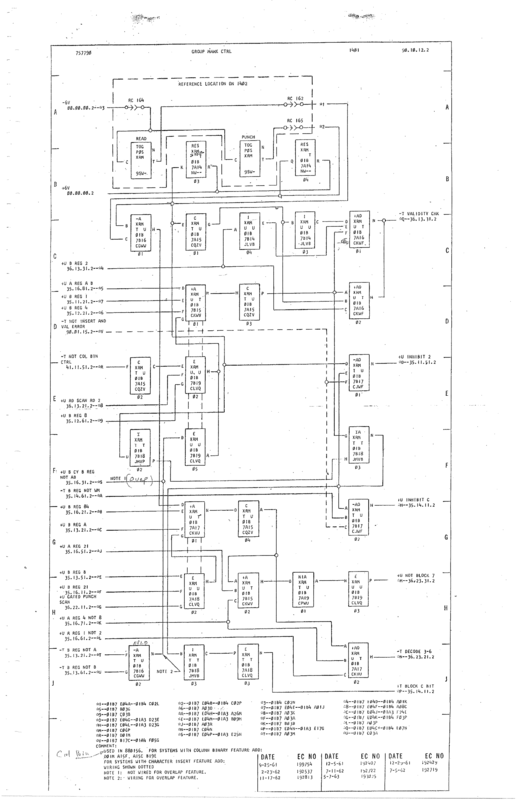 Hi Ken - Then what is missing from our documentation is any changed pages for other parts of the ALD where the circuit was modified and connected to the logic on the page you found. Might be useful for me to go through and annotate a copy of the pages as if they had been properly updated. You might be interested to know that the DE and CT machines punch one character differently. I was comparing the DE and CT 1401s and discovered that the CT machine has the A bit RPQ, but the DE machine does not. 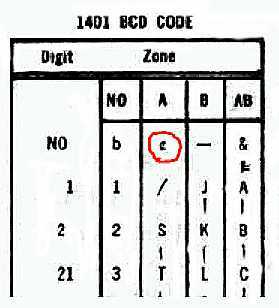 In a standard 1401 (DE), an A bit is punched as a 0. But on the CT machine, an A bit is punched as 8-2. With some help from Stan, I verified this behavior in the lab. The relevant character is an A bit with no digit (a blank with an A zone bit), not to be confused with a zero with an A bit. One consequence of this is that you can't read this character into the DE machine (since it is punched and read as 0), but you can read it into the CT machine. This RPQ is in the CT ALDs under 36.23.11.2. Header/Punch Card Code 8-2 and A-Bit Compatibility # 898148 (1401 Model A, B, C, E, or F) This feature provides A-bit compatibility between 1401 and 1410 systems. It reads 8-2 punching and translates to an A-bit in storage. An A-bit in storage punches out as an 8-2. It is not switch controlled. I'm trying to document exactly which options are installed on the CHM 1401s. I've put together the following list of options, along with whether or not the DE and CT machines have the option. There are still some question marks, so let me know if you have information. In particular, I saw a comment about "Tape Intermix" on the DE machine; does anyone have details? If I have time tomorrow I'll stop by the lab and try to nail down some of these either by testing instructions or looking at the ALDs. The 1406 Storage Unit adds up to 12K. Adds indexing and new instructions. Move Record (MCM). Indexed addresses. Price: $108 monthly, $4040 purchase. Adds asterisk protection, floating dollar, decimal control, and sign control left to editing. Price: $20 monthly, $795 purchase. Test for high/low/equal after compare. Price: $76 monthly, $2865 purchase. Price: $333 monthly, $11950 purchase. Supports 729V Magnetic Tape Units. Instructions: Special tape operations, usually with %Ux as the A address. Allows a serial I/O peripheral to be attached. Price: $101 monthly, $3845 purchase. Adds a buffer to hold a print line, increasing available process time. Price: $386 monthly, $12890 purchase. Processes column-binary-encoded cards and tapes. Installation: DE: ?, CT: ? Price: $101 monthly, $3685 purchase. Allows a card to be read and then punched. Price: $28 monthly, $1045 purchase. Required for Punch Fead Read on some 1402 models. Price: $56 monthly, $2095 purchase. Price: $255 monthly, $15380 purchase. Test any bit in a character. Requires Column Binary. Price: $20 monthly, $848 purchase. Adds six sense switches to the console. Price: $15 monthly, $582 purchase. Allows card read/punch to start while processing continues. Price: $25 monthly, $1005 purchase. Adds 32 print positions to the basic 100, for the 1404 printer. Price: $61 monthly, $2510 purchase. Adds 32 print positions to the basic 100, for the 1403 printer. To attach a 1404 printer. Price: $25 monthly, $1410 purchase. Prevents the printer from advancing to the next line after printing. Price: $78SUC monthly, $63 purchase. 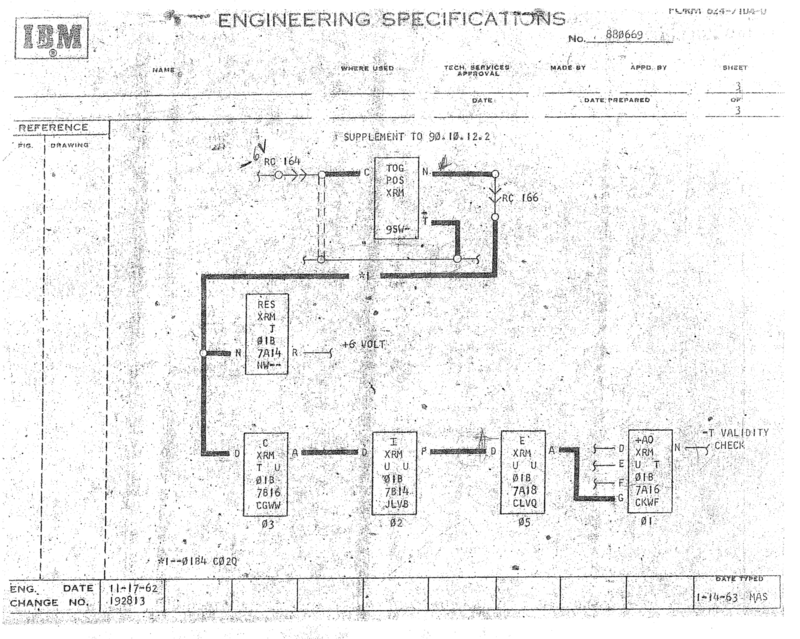 Read tape records written with zero elimination by a 7070/7074. Price: $35 monthly, $1330 purchase. Supports 729V Magnetic Tape Units at 800 cpi, set by switch on auxiliary console. Price: $35 monthly, $1620 purchase. Allows different 729 models to be mixed. and see connectors marked 7330, this machine has the option. Price: $NC monthly, $NC purchase. Allows a 1311 Disk Storage Drive to be attached. Price: $101 monthly, $4925 purchase. Permits two 1401s to transfer data between systems. Faster printing with a numeric chain. Price: $437 monthly, $30520 purchase. Required for Numerical Print on some 1403 models. Price: $50 monthly, $2045 purchase. Allows card reading mechanism to engage sooner. [ I do not think we have this option on either machine. Price: $10 monthly, $241 purchase. Printer skips lines faster after first eight lines. Supports polyester film ribbon on the printer. Price: $88 monthly, $2000 purchase. Allows printer chain cartridges to be changed. Price: $88 monthly, $2030 purchase. Read data from punched cards in 1404 printer feed. Price: $190 monthly, $10620 purchase. Required for Read Compare with a 1404. Price: $76 monthly, $4365 purchase. Allows printer to print on multiple adding-machine tapes. Price: $225 monthly, $5260 purchase. Required for Selective Tape Listing on some 1403 models. Price: $86 monthly, $4415 purchase. selected by switches in the card reader. Special Feature Instructions: Describes instructions associated with special features. IBM Sales Manual (1979): Extensive list of machines, options, and prices. Optional Features: Describes optional feature implementation for CEs. 1401 Model Info from Service Consultant Guides (1976): Options and prices for 1401. General Information Manual: Describes some optional features. Custom Features: Lists many custom features (Request for Price Quotation, RPQ). These features are not listed above and it is unknown if any are installed (apart from the Group Mark feature). The optional features were a mix of causes. In some cases, these come about because the sales force is finding some issue that blocks their sale of a 1401 system. An example would be Punch-Feed-Read, where a customer operating with the punched card mechanical predecessor equipment would have some part of their processing where they needed to punch information into an input card. It might be values that are calculated based on the input card and then stored there, but the key is that the customer had a workflow that involves a single card which is created at two different times, one part done based on some calculations or through merging information from other cards. To change the way they do things would be disruptive and require changing many stored cards from older runs. The potential buyer raises this as a reason that they will wait a bit before replacing their tab equipment with a shiny new 1401 system. Sales complains that they are losing business due to a product limitation. Someone develops PFR as an option. It may be enough to allay the customer concern, even if they don�t end up using it. In some cases, competitors force creation of these options. Someone has an alternative system which runs faster. Which is cheaper to develop, a new faster card reader/punch, a new faster CPU, or a feature that gives you an effective speedup for certain kinds of jobs? In other cases, an engineer has a flash of inspiration, suggests a way to achieve something like Read Punch Release or Overlap, and it matches market needs. Each option is a way of extracting some additional revenue from a customer, too. In other cases, a customer who is fairly knowledgeable and big enough to have clout due to their annual spend with IBM would suggest something should be possible, offer to pay for it, and then engineering would figure out how to do it. IBM entertained requests for custom features through an RPQ process, which could then be turned into standard offerings (but options not included on every machine). The 1401 evidences many waves of modifications and enhancements that were designed well after the initial systems were shipped. Look at all the addressing modifications for larger storage, index registers, address modification instructions, just as one small area that reflects changes which would have been MUCH easier to have accommodated in the initial architecture and design. Addressing fields with three BCD characters would not be the choice you made if you planned from the start to have 16000 locations and indexing � or at least the way I imagine the architecture would be made. They seem like clever hacks added after the fact � �we can use the zone bits of the middle character�. Back at that point in computing history, most programmers were highly focused on efficiency in design. Writing code to save a few character positions, a few machine cycles, or take advantage of special conditions to run faster � these were items of pride. Programmers would show off share their clever ideas widely. Not sure if there were contests a la IOCCC but lots of peer admiration when someone found a way to do things a bit faster/better/smaller. How was it done on the 1401? The dual printer 1401 was an RPQ Attachment. It consisted of a second print buffer gate mounted in a frame like the 1406. The second printer was attached to this frame. It was called a 1944 or 1924. I am not sure of which. A print command with a D Modifier character selected the second printer and it only took 2 ms to send the data to the buffer and from then on that printer was on its own. I'll have to see if John Malone still has any information on the RPQ. He wrote the 1401 peripheral support program that drove 2 printers and the 1402 at full speed. When I told him I had written about him he said he still had card decks and listings from those days. I'll have to start working on him about those. STL (Selective Tape Lister)	 July 3, 2006 - John Van Gardner (living in Georgia) noted pictures of lot of red wiring on the 01A4 gate. "When I looked at the card side photo the cards in F05, F06, F07 & F08 look like they each have two large power transistors. There is also a cable with all red wires coming from the C26 socket. The power transistors could be used to pick magnets. The only feature I could think of was the STL (Selective Tape Lister). It is described on page I-62 of the 1401 Special Features manual A24-3071-2 which you have. It has 8 magnets to space the individual tapes. A lot of banks had this feature on their printers. I looked at the 01A4 plug chart you posted on the web and it is like mine. Then I looked at page 22.04.11.2 sheet 4 of 6. It shows the 1403 summary connector #2 and the wires used in the STL feature. They come from the 02B8-C02 connector. If the red cable goes to the 02B8 gate thats probably the STL feature. That feature should include ALD pages 74.80.30.2 and 74.80.31.2. " ?Remote Recycle Control box? 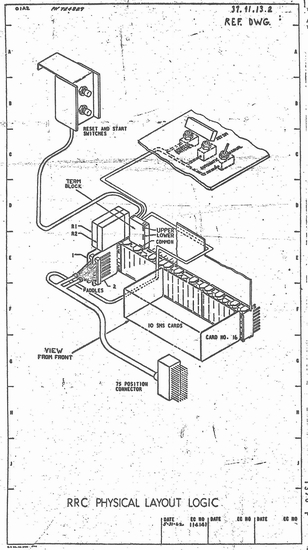 July 3, 2006 - John Van Gardner noted: " Also attached is a scan of the ALD page 37.41.13.2 which shows the Remote Recycle Control box. Note the 75 position connector. This is why I was asking about the connector that Bill Flora identified as the 1407 connector. The RRC connector was in the same area of the machine and also had a terminator plug. It was a good tool for trouble shooting bugs where the machine would not loop. I wonder if they had these in Germany."